Please let us know which color twine you would like around the box:green (shown), natural brown, ivory, red, black or dark blue. 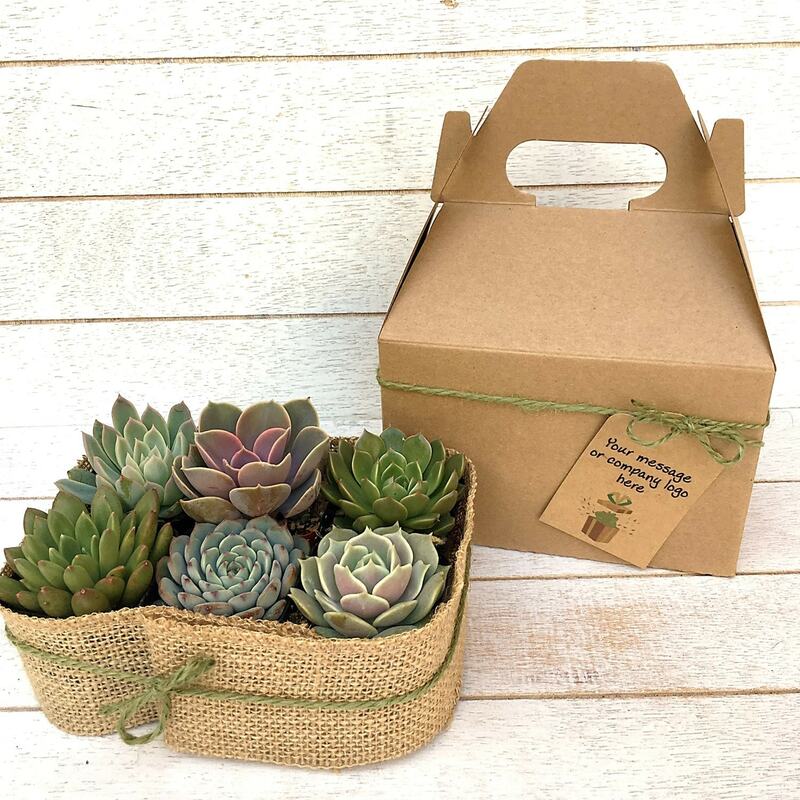 Succulent gift box with six beautiful 2" mini succulents, gift wrapped. 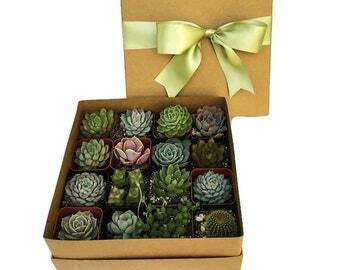 Would make any gardener happy Great hostess, birthday or valentine's day gift. We can include a plant ID sheet, that way you can get to know your succulents by name. Our gift boxes also make great client and corporate gifts and can be customized with your logo! Please contact us for details. ♥ Six high quality rooted 2" succulents (may vary from pictures depending on inventory, but we will always make sure to select beauties for you), each one is approx 2" in size in nursery pots. ♥ The 6 succulents are gift wrapped in a Kraft style gift box with twine around the box. Gift box is approx. 6"x4"x4" (height including handle is approx 7.5"). Twine color options: green (shown), natural brown, ivory, red, black, dark blue. ♥ Customizable gift tag - just let us know what you would like us to print on the tag. A message, your logo or both. ♥ Small care instruction card and pipette for watering are also included. ♥ Optional: Plant ID card - select from drop-down menu at checkout. Amazing shop to purchase from! Communication was fantastic. I loved the option of a heat pack- gave peace of mind shipping into areas affected by the polar vortex.